The book covers a number of quite diverse topics and has underlying chemistry, especially combustion chemistry, as a unifying theme across the chapters. There is frequent reference to the research literature, and accounts of many case studies. The text is backed up by numerous figures and tables. There are over 40 numerical examples in an appendix, highly suitable for tutorial use, with full worked solutions in a second appendix. 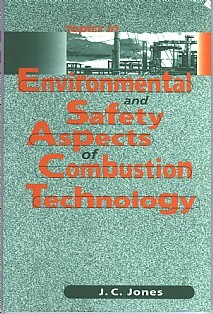 Sulphur in fuels and its environmen-tal consequences; Oxide of nitrogen emission by fuels; Particulates; Wastes from coal winning, storage and utilisation; Incineration of waste; Pyrolysis and gasification of waste; Aspects of the combustion chemistry of hydrocarbons; Hazards in hydrocarbon processing and utilisation; Fire retardation and extinguishment; Some relevant experimental techniques; Reflections on applicable thermo-dynamics; Numerical problems; Solutions to numerical problems. Poststgraduates in chemical engineering, fuel and energy technology, safety engineering, environmental science, applied chemistry, final year undergraduate students in those disciplines. Industrial and government R & D libraries.